No permission is given to post, copy, print, share, distribute or link to without written permission from PopArtDiva.Com. A little love just in time for Valentine's Day and a little background on the Heart Symbol and it's association with Love and Valentine's Day. Ever wonder why our symbol for a heart doesn't look anything like the human heart? 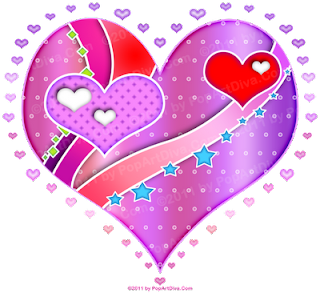 I was thinking about that when I was designing this Pop Art Heart Design for The PopArtDiva Gift Gallery for Valentine's Day and I decided to do a little research to find out the origins of this universally accepted symbol for the heart. The seventh century B.C. city-state of Cyrene traded the rare, now extinct, plant called silphium which was used as a means for birth control. Since the seedpod of the silphium looks exactly like a valentine's heart, this was sited by many as the birth of the modern Valentine Heart. The other theory involves the similarity of the contemporary heart symbol to various parts of the female anatomy or, when the heart is inverted, part of the male reproductive equipment! The heart symbol was promoted widely by the Sacred Heart cult starting in the Middle Ages and this may well have been the beginning of the dissemination of today's classic heart symbol. Whatever the origins, this is the main visual symbol associated with Valentine's Day and love. Today we even use this heart symbol to replace the word "love" and I can make a good guess that practice started with the ad campaign by advertising agency Wells Rich Greene in the mid-1970s to save New York from bankruptcy and the bad P.R. it was drowning in - remember the famous garbage strike of 1976? The actual graphic was designed by graphic artist Milton Glaser, who did it pro bono! Now that's a prime example of the power a graphic image can have on the mind, the heart and the culture of it's environment! From I ♥ N.Y. TO I ♥ POP ART! All this of was rolling around in my head as I designed my newest Heart Pop Art and I made the decision to keep the image as simple as possible with just a touch of pop art style. Whether you're looking for Valentine Gifts or a unique Heart Graphic to license, my Heart Pop Art will bring that historical shape to you with a contemporary Pop Art Diva touch. Wondering about the History of Valentine's Day? Check out History of Valentine's Day!